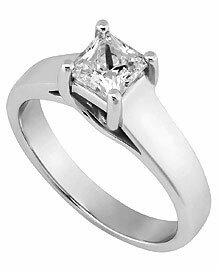 This classic 14k white gold ring with trellis setting features four prongs, which sweep upward from the ring to hold the diamond of your choice. The ring can hold a princess diamond ranging from 0.25 carats to 3.00 carats. The width of the ring ranges from 3.1mm to 6.1mm wide depending on the center stone size you choose.